Do you agree with the Godhra fire report? 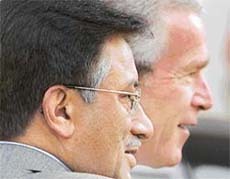 US President George W. Bush (right) and Pakistan President Pervez Musharraf at a press conference in Islamabad on Saturday. N.D. Tiwari, who has been sulking for quiet sometime for allegedly being marginalised in Congress hierarchy, today quit as Uttaranchal Chief Minister and sent his resignation to party President Sonia Gandhi. Rashtriya Lok Dal leader in the Vidhan Sabha and Irrigation Minister Munna Singh Chauhan resigned today. He would be replaced by another RLD leader, Dr Merajuddin Ahmad. President of the Uttar Pradesh Export Corporation, he would be sworn in at the Raj Bhavan tomorrow morning. I believe democracy is Pakistan's future. There should be elections in 2007 and I discussed with the President and he made it clear that he will hold elections in 2007. Simmering tensions in Goa’s mining belt got out of hand today after a contingent of the Rapid Action Force opened fire on a mob comprising RSS workers, who were terrorising Muslim residents of Sanvordem town. Charging Justice U C Banerjee with letting himself for "political manoeuvring", the BJP today said the probe committee's action in submitting the report had "played truant" with the judiciary. Even as the city has become a haven for “land mafia” that enjoys the patronage of politicians and bureaucrats, Ms Ratna, former Chairperson, Punjab State Social Welfare Board, today spilled the beans on the burning issue by alleging that she was “unceremoniously removed” from the post of Chairperson of the Improvement Trust, Amritsar.